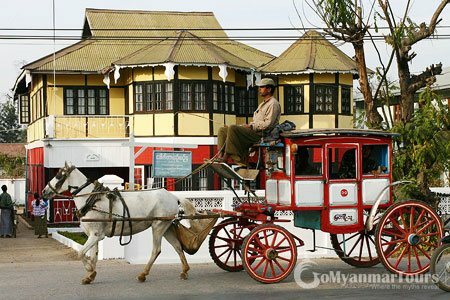 Today meet your guide and then begin your Mandalay tour at you appointed hotel in Mandalay, drive on a scenic road (80 km from Mandalay and take us 2 hours) to the former British hill station of Pyin Oo Lwin (Maymyo), a delightful small town of colonial-style buildings, markets, and a botanical garden. Feel the historical atmosphere by traveling through town in a traditional horse-drawn carriage. 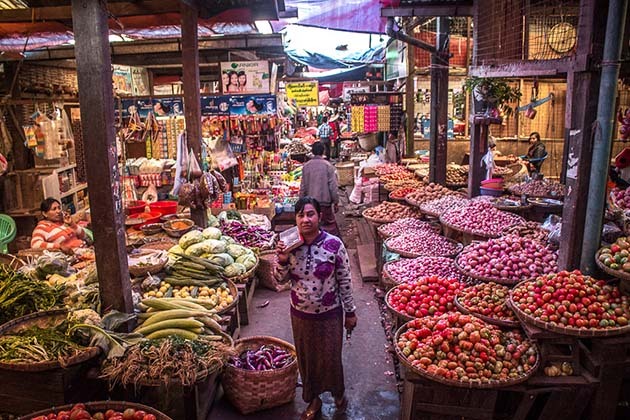 After that, hit the local market to gaze out at the local life and an array of local products and the botanical garden. 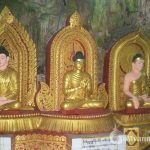 Following your lunch at a local restaurant, then venture out to visit the Peik Khyin Myaung Caves, caves almost as old as the land itself and proceed to Pwe Kyauk Falls, a favorite picnic spot for local people before returning to Mandalay. Today your lunch is included. I would like to check with you about Land Tour in Myanmar for 2 persons. Preferable with French speaking guide. The date for the tour is 21st-28th January 2016. They will be arrived on 21h January in Yangon. We are looking to visit ; Yangon, Bagan ( with the Balloon Flight over Bagan) Inle Lake and Mandalay. Could you give me approximate price/person? I’m looking for the good price ? Many thanks for your message and your interests in our services. I got your request and noted that you’re interested in a land tour in Myanmar for 2 persons in January 2016. Can you advise us your email address so that I can send the detailed itinerary and cost for your reference? What is the internet access like in Mandalay? Internet seems to be not reliable in Mandalay. Although internet access can be found in some hotels, restaurants or tourist sites, the speed is quite low and some popular websites such as Facebook, Gmail can be blocked. 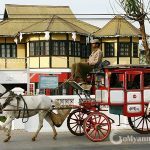 Where can I rent motor bike in Mandalay? In Mandalay, there are a number of addresses for you to rent a motor bike, but one address can be recommended for you is Zach Benoy of Mandalay motorbikes. Motorbikes or bike cycles are always available in Zach Benoy. Do the monks’ parents pay for Monastery when their children live and study there? Yes, they do. They pay around US$100 per month for their children to live and study in the Monastery. What is the most famous Monastery in Mandalay? 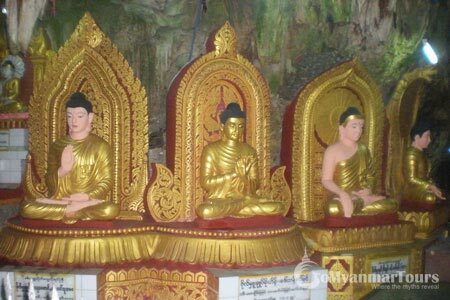 The most famous Monastery in Mandalay is the Mahagandaryone Monastery which is located in Amarapura. It takes you 20 minutes driving from center of Mandalay. How many monks are living and staying in the Mahagandaryone Monastery? There are around 1,500 monks living and staying in the Mahagandaryone Monastery. They are from 5 years old to more than 60 years old. The monks can choose the time they stay in Monastery and they can leave to get home whenever they want. What is the most attractive thing in the Mahagandaryone Monastery, Mandalay? We visit the dining rooms, living rooms, classroom and the place that people offer the food, milk and sweet for monks. We also see the Monks in the Mahagandaryone Monastery step by step walk into the dining rooms for their morning or afternoon meals. This is the most attractive in this place. They are from hundreds of living rooms to the center road, join together with jars, napkins in hand and slowly, quietly to the dining rooms. What is the main food of the monks in the Mahagandaryone Monastery? They can have pork and eggs curry but just for morning meal (around 9h30am) and cereal food such as maize, corn, rice, peanut, bean… they also have cake, milk…. Should I carry plenty of cash when shopping around Mandalay? ATMs are not common in Myanmar, so make sure that you bring enough cash during your trip in Mandalay. The rate of crimes in Myanmar is low and local people almost are Buddhist followers who are generally honest. But do not show much money to the local when traveling around even if in your home country. Is there any female monks in Mandalay? Yes, there are. The male monks and female monks stay at separately monasteries. 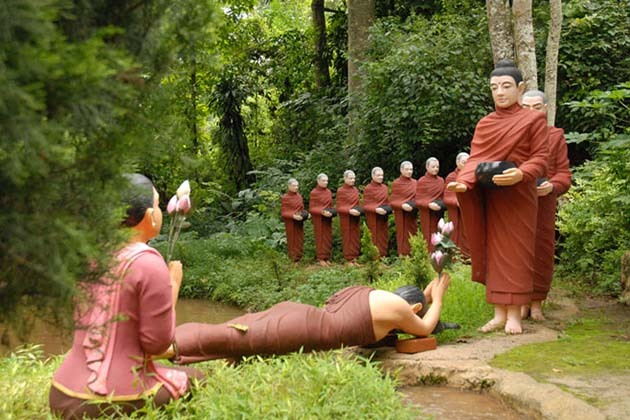 They take different color costumes, male monks take dark brown while female monks take pink color costumes. How long is the U Bein Bridge? It is about 1.2 km from this side to other side of the river. The end of the bridge is a very big pagoda. What is the name of the river where the U Bein Bridge? 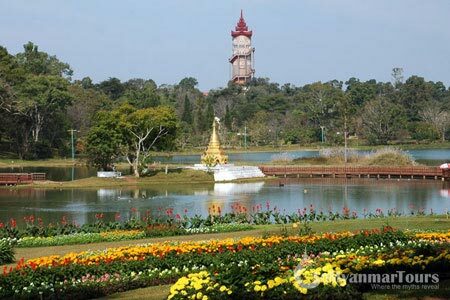 It is Taungthaman Lake, located in Amarapura nearby Mandalay center. There are many nice boats and boat men sailing tourists around the U Bein Bridge to see sunset. It’s a great time of the day. What is the material of the U Bein Bridge? It is teak wood, a special wood in Myanmar. How old is the U Bein Bridge? The U Bein Bridge (U Pain Bridge) is more than 200 years old when Lodges of the villages another side wanted to go to the Capital Amarapura more quickly, so they built the bridge. It is now a very important road of the local people in two sides of the river and the main site for tourists who visit Mandalay. When is the best time to visit U Bein Bridge? It is sunset time. From 5h30pm to 6h30pm. You should walk to the middle of the U Bein Bridge then take half an hour boat trip around the bridge to get the best moment ever of the sunset time. What kind of boat do the local people use for tourists? They are wooden boat with more than 6 people can take at same time. The boat men knows well the place to stop for best photo shoots. Are there any activities during walking along U Bein Bridge? There are not many but you can stop in the middle of the Bridge, step down the island and drink coconut juice, beer or tea… There are few drink workshops in the island of the river. How much should we pay for boat man for 30 minute boating during sunset? It costs around 5,000 kyats per boat for every half an hour. They will take you back to the island or to the jetty. Are there many ATMs in Myanmar? Is it necessary for me to bring cash? There are few ATMs in Myanmar even in big cities. You should bring plenty of cash when traveling in Myanmar. In addition, your cash must be clean; it means no creases, stains, marks or tears. 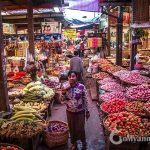 Are credit cards widely accepted in Myanmar? Actually, credit cards are not common in Myanmar. They are only accepted in five-star hotels, big restaurants. Thus, carrying cash when travelling in Myanmar is the best idea. I plan to buy Luntaya (woven silk) for members in my family as a gift, so I would like to ask you where can I buy Luntaya in Myanmar? Luntayan is very famous in Myanmar, especially in Amarapura near Mandalay and Inpawkone village in Inle Lake. Besides, those destinations also offer other items such as clothing, silver, silk. I plan a vacation in Myanmar, and I want to find out how safe it is to bring a laptop or Ipad during the trip and whether internet access is good or not? In Myanmar, you don’t worry about security in this city because the rate of crimes is low, and local people here are Buddhist. They are generally honest. In terms of Internet connection, Wi-Fi is also available, but depends a lot on where specifically you are. In Mrauk-U I had no connectivity whatsoever, in Mandalay or other big cities only in the hotels’ lobby, big restaurants, but the speed may be slower in comparison with your expectation. Should I carry plenty of cash when I visit Mandalay? Generally, ATMs are not common in Myanmar, so you should prepare cash when travel to Mandalay. You should not worry about the security in this city because the rate of crimes is low, and local people here are Buddhists who are generally honest. But in any case, do not flash too much money or precious items. What should I wear when visiting temples in Myanmar? Wearing modestly and respectfully is recommended when visiting sacred places in Myanmar. Shoulders and knees should be covered when getting in worshiping and religious places. Any recommendation for souvenirs in Myanmar? What is the best time to see U Bein Bridge? Sunset is the best time for you to admire the beauty of U Bein Bridge. Hire a boat to get a close up view of the bridge from the water and snap stunning photos. What about the standard of domestic flights in Myanmar? There are some domestic airlines in Myanmar including Air Bagan, Air Kanbawza, Air Mandalay, Asian Wings, and Myanmar Airways, offering flights within Myanmar. Most domestic flights are safe, cheap, but sometimes, having flights cancelled without proper notice. 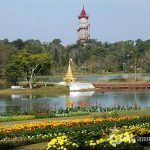 What is the best time to see Shwedragon pagoda in Yangon? The best times to explore the Shwedagon pagoda are at sunrise or at sunset when the large, reflective emerald that sits in the center of the golden stupa. That emerald catches the changing light and reflects it out beautifully. Is it possible to photograph when visiting religious sites in Myanmar? Most of sacred sites in Myanmar allow tourists take photos or video; however, some temples or pagodas do not permit to photograph inside the temples. Don’t worry because there will be notice boards for tourists in these places. Should I take Malaria prophylaxis for a trip to Myanmar? Mosquito problem depends on where you go and what time of the year, but the first advice for you is avoiding mosquito bites, especially at dawn, wear long clothes and use mosquito repellents. Malaria is not popular in in Myanmar, except on land routes into the mountains and at the beaches. I am planning to travel Myanmar next year. Is it safe for travel alone? Myanmar is a very safe country to visit because almost Burmese people are Buddhists; foreigners are treated especially respectfully. Capital crime is virtually unknown. The occurrence of theft or any other criminal cases involving foreigners is negligible. Carrying larger cash amounts does not pose a big risk. Of course, it is advisable to not show it openly. What is the local currency in Myanmar? The local currency is called Kyat. Current denominations in use are available between 1 and 10.000 Kyat. 1000 Kyat are about 1 USD. Coins are no longer in use. What time will Myanmar’s banks be opened? Office hours for state banks are from 09:30 to 16:00, while private ones are from 09:00 am to 17:00 pm. Saturdays and Sundays are holidays, but for some companies, Saturday is only a half-day holiday. All offices are closed on Sundays. I am concerning about boat trip to appreciate U Bein Bridge as a part of my Myanmar tour. Which is the best time to take a boat trip there? When sun sets, from 5-6 pm is the best time for boating around U Bein Bridge. Step down the island and drink coconut juice, beer or tea and get the best moment ever of the sunset time in U Bein Bridge. What should we pack for our an excursion in Myanmar? 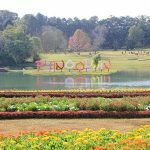 – Clothes: recommend taking some long T-shirts or pants in case of visiting pagodas in Myanmar as your shoulders and knees should be covered. -Shoes: hiking shoes are necessary for you to explore some temples and pagodas in mountainous areas. – An umbrella and rain coats are also necessary for your trip as the weather in Myanmar is quite unpredictable. I am planning to spend my 2016 vacation in Myanmar next year, and I am quite interested in air balloon trip in Bagan. But is it safe enough to try? Bagan is the most popular place to take to the skies (most spectacularly at sunrise or sunset). Highly recommend to try an air balloon trip for bird’s eye views over this beautiful land. What are the comfortable clothes when visiting pagodas in Myanmar? Visitors who wear too short or too thin clothes will not be allowed to visit pagodas. Wearing these kinds of clothes mean you disrespect to Budhha.